Success – It’s all about eliminating the wrinkles and getting the right wardrobe – NOT! 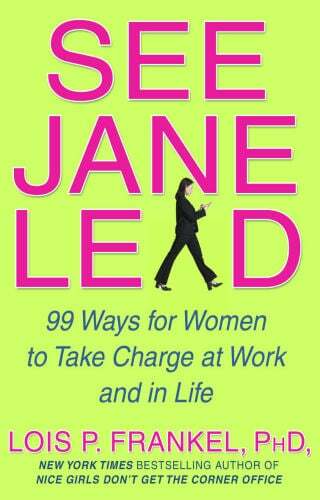 What sage advice for business women was included in the 128 pages? 15 different types of wrinkle creams were advertised – yep, I counted – including the $930 La Prairie Pure Gold featuring “finely ground 24-carat gold” WHY gold ??? Just because we can? Seven of the fourteen business women profiled were either in the cosmetic / beauty industry or in fashion – including a four page feature story on the stylist for channel 7 Kelly Smythe. She sounds a talented, hard working lady but the story seemed to be implying that the main reason channel 7 is rating well is that the stars now all dress “for success” and that Kelly is there to “keep a check” on how they all look. Surely there is more to success than just the right pants suit? Another full page profiled an ex-supermodel, Carla Bruni, whose main claim to fame seemed to be that she “once dated Mick Jagger and Eric Clapton.” The magazine claimed there was more to her than just her love life – but if so, why mention it repeatedly? The fashion spread featured a model that must be no older than 15. She was obviously very young and physically almost pre-pubescent. Flat chested, all long, gangling limbs, shown wearing a 70’s inspired playsuit and enormous retro wedges in one shot – oh how “Career Gal”. And if the Editor knows her readers are older (and by the looks of all that anti-wrinkle advertising they are targeting over 35’s) what is this spread hoping to achieve other than making their readers feel inadequate? The recipe section ( you won’t see this in boy’s own BRW) featured silly, fiddly Hors d’oeuvres (what career women has time to whip up “Mulloway and caviar tartare”? “Iberico ham and quail egg tarts”??). I particularly resented the guilt loaded implication that crackers and cheese were now a definite no no and that even “risotto balls are considered passe.” Blimey – don’t come here for nibbles then. Oh look I could go on and on…and don’t even get me started on the tokenistic story buried up on page 114 on what Feminism means today entitled “The F-word” – mmmm, me suspects this may be a revealing little Freudian slip. The F word that came to mind for me when reading this magazine was … frivolous. So if it is not all about the clear skin, clothes, and the oh so modern meals – what does it take to be a successful businesswoman? I do not profess to know all.Despite my deep love for children and years of experience teaching and designing special programs for adolescents, I will never be part of the “Mummy Mafia” who know it all about child rearing. 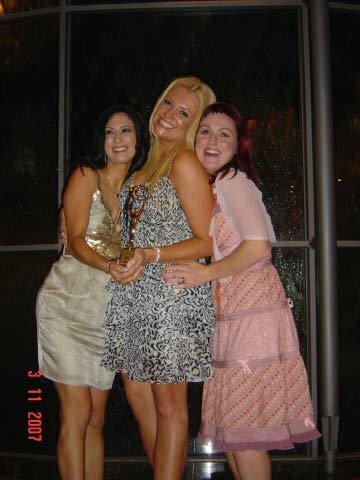 And despite my business qualifications, years of working on improving business performance, and enlighten’s recent Award as AUSTRALIAN Small Business of the Year for Children ( Ohhh I have been dying to get this achievement out 🙂 more in a minute! ) I do not think we are perfect by any means. We just do the best we can on any given day. However, I do think many of the ways in which we do business work well – not only as they are founded in best practice principles, but as they utilise our natural capabilities as women. I thought it appropriate to share one of these learnings here. We are transforming options for women. Significantly, within enlighten we have also embraced what is unique and harnessed traditional female qualities; women are skilled in effective communication, empathy, and the ability to build relationships. Women are also passionate about the welfare of all children and feel a particular affinity with the plight of adolescent girls. Yes. YES! I believe much of my success is due to may ability to network and influence AND I also deeply resent being bullied – who doesn’t? In recent times I have had my own run ins with business bullies. Often bullies will claim that their behaviour is harmless, just part of “hard nosed business dealings.” I don’t buy into this approach. This does not mean we have to succumb to the child like desire to be liked by everyone. Tough decision may need to be made, and although some women find it hard to be assertive, setting boundaries will ultimately earn you respect and may even get you promoted (“Nice Girls Don’t Get the Corner Office” is another fascinating read by Dr Frankel). However, threats and power games destroy what might potentially be very positive, mutually beneficial relationships. Business is all about building meaningful relationships. With clients, with colleagues, with other service providers. Leadership development guru Sally Helgesen has gone so far as to declare women’s skills in building relationships and webs of inclusion as the “female advantage.” My business partner Francesca and I are both passionately in love with our business and when others see this, they fall in love with it too. I will be forever grateful to the men and women I admire who have also fallen in love with enlighten and supported us with our work. I thanked many in my previous entry after winning our State Award but want to also mention the wider network I have established that is so valued. Clinical Professor David Bennett AO, Head, NSW Centre for the Advancement of Adolescent Health, National President, Association for the Wellbeing of Children in Healthcare, Dr Michele Beal, Stress Management Specialist, Greg Byrnes, Program Director 2UE radio, Jenny Lewis, CEO, Australian Council for Educational Leaders, and of course last, but by no means least, Precedent Productions, The Commonwealth Bank and all the other major sponsors of the Australian Small Business Awards who have just made enlighten the Australian Small Business Champion, Children’s Services. I am so thrilled for you and the team on winning the National Small Business Champion Award for Children’s Services!!!! It goes to prove that ethical, women focused, authentic business’s such as yours can succeed to the highest level. It is such an honor and privilege to be part of it all. I also am totally sick of women’s magazines and their focus on our bodies and its “imperfections”. This week for the first time in ages, I went to a local newsagent looking for a mag that would inspire, educate and inform me on the issues real women are discussing and thinking about. You know, I came away with nothing, nada, zip!! I want to hear about real issues, real stories, wonderful books, women’s travels, dreams and fears. I don’t want to be told I am less, not good enough, too big or too small!! So I am with you Danni – I am not going to buy any women’s mags until they offer me something bright and real. Helene Lerner. 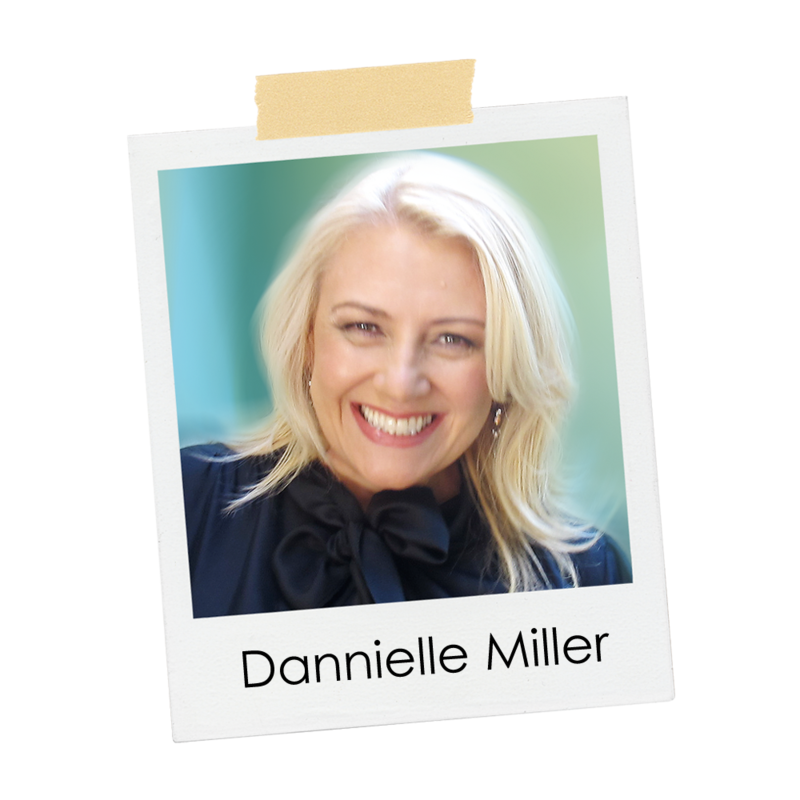 president, Creative Expansions Inc.
Congratulations Danni on the national award. When I read Helene Learner’s words recently, they really resonated with me and reminded me of many of our discussions and of some of the many qualities you bring to leadership. I am so proud of our team and their work. In the words of Kimberley Till, vice president of Media and Entertainment for Microsoft. I am also so thankful for the continued encouragement and support shown to us by our amazing, caring and dynamic network. 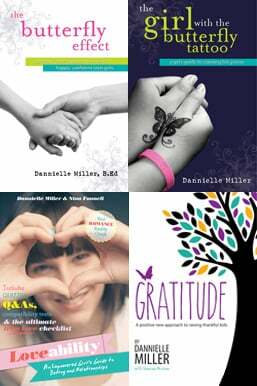 I am very fortunate to be surrounded by people who are not only highly regarded experts in their chosen industry but also share a genuine concern for the welfare of teenage girls in our country. CONGRATULATIONS … an outstanding achievement for an outstanding business. As many of us know the Commonwealth Business Awards recognise businesses innovation and the outstanding achievements of the small business sector. 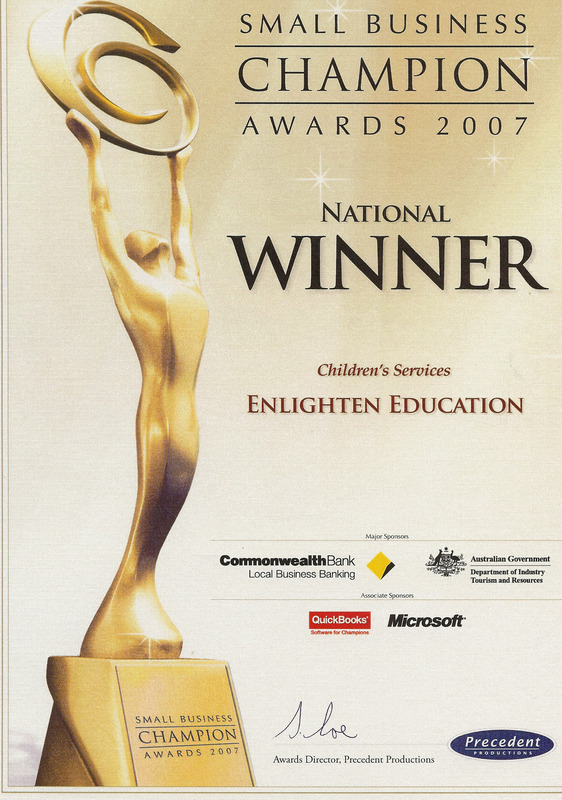 What more can I say … ‘enlighten education’ is now nationally recognised as a leader … WOW … well deserved!!! I feel honoured to be a part of it all. Thank you so much for your article this week … there are so many valuable points. One in particular resonates with me as I recall an incident recently where I was the recipient of some very negative and bullying comments. It was quite ironic as I was discussing an issue with a member of the team from Consumer Affairs, and to my knowledge this is a business that proports to support and aide customers to resolve their problems … it shouldn’t set out to create them! The team member I dealt with was determined to belittle me. Her approach was “hard nosed” and in effect I felt I had to put my “enlighten” methods into practice and call the inappropriate behaviour. Why oh why must there be power games? Surely everyone ultimately looses?